These large, and often ferocious, animals are still soft at heart when it comes to their calves. 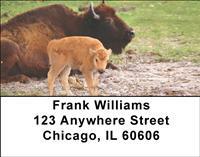 Like any parents, bison play and nurture their young until they reach an age where they can look after themselves. In the meantime, they love to play, romp, and snuggle with them while they still can. These beautiful check images show rare moments of tenderness that are not often captured on camera.